It's a nice suggestion. I will send it our developer team. But I can't understand it - put in your bit bucket, what is it? Can you give me a screenshot? Wisecleaner is good. But it doesn't clean the data of clipboard. And I want to support several secure deletions. (for example, Guttman type). Two thumbs down on going back to that ugly round floating ball. Worse decision Wise has made since I have been using 365. Takes up a lot more space, than the rectangular box and does not list programs. Just one big fat ugly round ball. I will not install and load the last version of the individual monitor program with the rectangular box. I will just unclick "Stay on Top" because that fat round ball is so ugly and is impossible to avoid noticing when it is on top. Wise Care 365 support to clean solid disk. Does it not recognize your solid disk? which part, Common Cleaner/Advanced Cleaner, or anything else? I wonder why you have changed desktop gadget cpu to only temperature, at the expense of very more useful control cpu/processes. Second, in the program section privacy protection, if I uncheck entries, simply reopen Wise Care 365 main Windows, settings returned to default. Sometimes after reboot, I see that some items unchecked change on checked. This is a problem for those like me, has setup Wise 365 for automatic cleaning. 1, The floating window also can display cpu usage. close wise care 365 and make sure the wise care 365 tray is not running. we just want to remind user, they should remove browsing history to protect personal privacy. 3, Can you give us more details, which items are changed to the default settings when you reboot system. (a screenshot is better), Thanks! Thank you very much, very useful tip Are there other parameters for floating window? For instance, is there one way to shows both temperature and cpu usage? To restore items on Optimization section, just I have to select item and click on the bottom right "Default"? No need for other actions such as logoff or reboot? For item setting changed, for instance in the Privacy section if I uncheck History visited pages, I just close/reopen Wise365 main window and it's checked again. Then in common clean section, if I uncheck Windows metro cache and Installer cache, after reboot they are cahnged to default, then selected. Conversely if I check Prefetch data, after reboot it is unchecked again. All this only in the manual System clean. In the Option of auto clean instead, the program keep custom set. in common clean section, if I uncheck Windows metro cache and Installer cache, after reboot they are cahnged to default, then selected. Conversely if I check Prefetch data, after reboot it is unchecked again. All this only in the manual System clean. I'm quite sure to have reported this problem in past months/years, but I can't find it in the forum; maybe did I send an email? Anyway, it doesn't happen only after a reboot. I understood those are the recommended (and default) settings. It seems like at WCare365 closure those settings are forgotten. I compared the config.ini after WCare365 forgot the settings and the (last saved) config.ini after I restored my preferred settings (all settings) and I noticed the first one misses the [CheckedTypes] section. Hence in some circumstances the config.ini loses the [CheckedTypes] section during the closure and at WCare365 restart the problem appears. 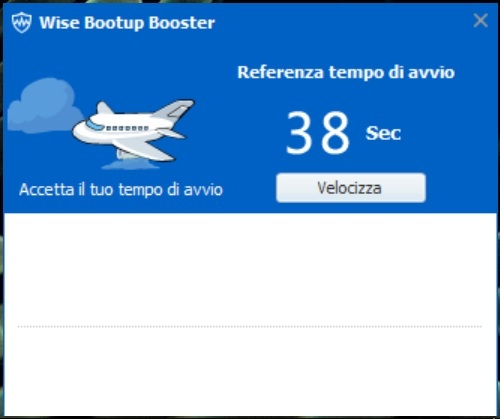 I've got a problem with Wise Bootup Booster since last Saturday 12 Dec 2015 (IIRC), when (probably) I've updated to the new version (3.93.351). Furthermore I get a yellow triangle on the connection icon (but the connection works...), but I don't know if this is related to WCare365 (my ISP did some job in the last few days/weeks and it should update my connection to fibre optic... I hope!). Does this happen only to me? Or there are other reports about it? I did some tests in Win8 and Win 10 using wise care 365 v3.92, but I didn't find the forgot settings issue. I ticked all items one by one, then close wise care 365, then restart system, re-open wise care 365, all items were ticked. Your video, I can't find any problem. The bootup time issue, we found it and trying to fix it. The message issue, it should be fixed, please check it. The "yellow triangle on the connection icon" issue, I don't think it was caused by wise care 365. Does it appear again? Your video, I can't find any problem. The video shows the options that are unticked when the settings have been forgotten. In the next message (after the video) I wrote they are the defaults. I'll try to reproduce the problem in another video. Edit: I tried and I can't reproduce the problem anymore. I hope that it has been fixed in some way and that it won't reappear! I did (a lot) more tests. It seems the firewall blocks the blue messages and the boot up seems slower too. If I disable the firewall and restart, the blue messages will appear and the boot up seems quicker. I think boot up booster try to connect itself to internet and that's why there are these problems. Where should it get those blue messages? Does it try to connect to WiseCleaner website? I have temporarily solved this problem adding WiseBootBooster.exe (port 80) to my firewall outbound exceptions, but this didn't happen before version 3.9.3 (3.9.2 was ok). 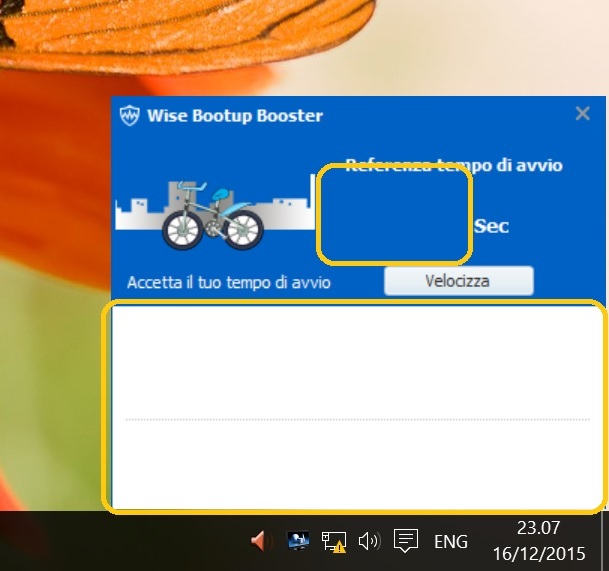 My suggestion is WiseBootBooster.exe shouldn't check internet to show those two blue messages. Important note about my firewall settings: I'm blocking all programs, inbound and outbound, with few exceptions in the outbound firewall section (browsers, wise programs port 80, security software, udp outgoing, and so forth), and with inbound exceptions for some p2p programs. Moreover, I saw the change-log says something about the weather (Fixed the issue of inaccurate weather information), but I don't know where I can see the weather. Maybe is it a feature that appears using wise care 365 installed version (I'm using the portable one) ??? Or maybe the PRO one? I installed WiseCare365 to see if I can see the weather feature, but it didn't appear. Likewise, I tried to start (the installed) WiseCare365 with windows (in addition to WiseBootBooster), but it didn't start. 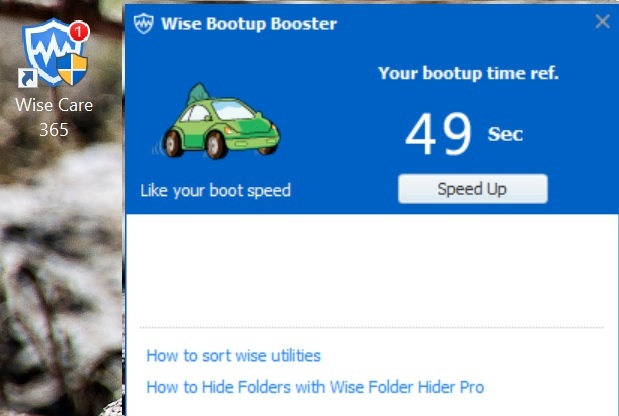 In fact, when I click on the Speed Up button of WiseBootBooster window, it says wise care 365 is not set to start with windows: You need to speed up your PC manually, for Wise Care 365 is not set to run on startup. I'd use because instead of for, in the previous sentence. So I created a task to start WiseCare365 at windows logon, disabled the firewall and saw if the weather feature appeared: it didn't appear. My suggestion is (the installed) WiseCare365 should create the task to start at windows logon. I tried also to do a cleanup, after that I restarted my machine: the result was I saw again the yellow triangle on my connection. I've investigated and found that if I tick System Log Files only (in system cleaner, common cleaner, windows system), i.e. all the other options left unticked, the yellow triangle on the connection appears; hence the problem is in that section. 15 junk files were found, a total of 3,1 MB. 0 traces have been found. After more tests, I excluded C:\WINDOWS\SysWOW64\log.txt and now the triangle doesn't appear anymore. My suggestion is WiseCare365 and WiseDiskCleaner shouldn't find that file. Another issue I found is %localappdata%\Local\Microsoft\Windows\WebCache\*.log files are displayed twice in the results and they should be present only once (you can see this issue in the previous spoiler code). The bootup booster window has 3 parts, part 1 display bootup time, part 2 display weather, and part 3 display some Windows How-To tips. Part 1 doesn't connect internet, but part 2 and 3 need to connect wise server , if there is not internet connection, part 2 and 3 will be blank. Neither the Free version nor the Pro version, neither the Installed version nor the Portable version have weather feature. At first, you are using the portable version, I think you didn't tick "Start at Windows Bootup" option, so, when you install wise care 365, it will read the portable versions configuration file. You can find the configuration file - config.ini in %appdata%\wise care 365. About words 'because' and 'for', my colleague tell me, using 'for' or 'because' is correct. The removed log.txt file caused internet connection issue, I can't verify it, I can't find this file in my system, can you give me a copy? Double WebCache issue, yes, I saw it, we will fix it asap. The file log.txt should be in C:\Windows\SysWOW64, its size is 0kb, The process (notepad.exe) cannot access the file because it is being used by another process. That's possible FOR English is not my mother tongue. part 2 and 3 need to connect wise server, if there is not internet connection, part 2 and 3 will be blank. This could explain why I have NEVER seen weather informations, but I'm quite sure to have often (I'd say always, but I don't believe my own memory) seen Windows How-To tips, even if WiseBootBooster.exe wasn't in FW exceptions. I ticked it in both versions (installed and portable). The portable version configuration file config.ini is in D:\Applicazioni\Programmi portable di WISE CLEANER\Wise Care 365. Given that it didn't start with windows, I tried to install it; but it didn't start too. The installed version should read its config.ini in its path, not the one in the portable path; and vice versa, the portable version should read its config.ini in its path, not in "%appdata%\Wise Care 365" (and that is not present, normally, because I uninstall the installed version and delete the remnants of it). I installed WiseCare365, disabled the firewall, lowered UAC settings to the minimum (not disabled, by the way), re-enabled DEP (bcdedit /set nx optin), re-enabled the Geolocation service (it was disabled, trying to restart it gave an error, solved deleting a registry key: HKEY_LOCAL_MACHINE\SYSTEM\CurrentControlSet\Services\lfsvc\TriggerInfo\3), ticked "Start at windows bootup", ticked "run bootup booster", unticked the other three settings under them, left WiseCare365 opened, restarted windows: BootBooster didn't show any weather informations, WiseCare365 didn't start, in task scheduler I can't see the WiseCare365 task (if it should be created there). I took the WiseCare365 icon in the screenshot because I see a red ONE on it and I didn't see it previously: is that normal? Using: windows 10 x64 home/standard, custom scaling 150%, res. 1920x1080 color depth 32bit, UAC at its lowest setting, DEP at its default setting, Windows Firewall disabled, Windows defender enabled, no other antivirus/antimalware suites (at least, not enabled). I found a language mistake. The text in the german language file is not correct. See attached image. NeedClean=Extensive use of computer generated a lot of junk files. NeedClean=Ihr Computer arbeitet, um viele Junk-Dateien für Sie zu erstellen. 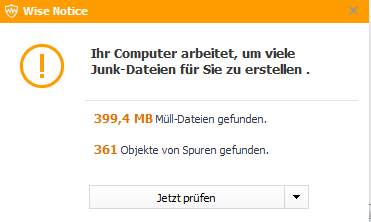 NeedClean=Die umfangreiche Verwendung des Computers generiert eine Menge an Junk-Dateien.